What was the general task of a superhero? Beating down villains and maintaining law and order, of course. What about beating down a wrestler from a well-known family with a lot of history in the league? Not exactly... But it would probably be a fireproof way to make name for yourself. That was the prime motivator for tonight's match in Starboy's mind. No, he was not yet all too familiar with all the wrestlers in Tension, not to mention Friction. But he had heard the name Kamiya before... And he was fairly sure that not only once or twice. And even if Kairi Kamiya might not have been the most famous wrestler of the family, it surely couldn't harm to show her the might of a hero. As The Weeknd started rhyming his tunes in the arena, it was time for the hero to make his appearance. Once again Star felt good about his theme... It was a very popular song, and in his mind that equalled more popularity for himself as well. And that prospect gave him confidence, that was readily apparent as he marched down the ramp towards the ring. Getting up onto the apron, Star immediately climbed onto the nearest turnbuckle, showing off a victory sign to the crowds. His expression was not all too happy or flaunting, but a steadier and more determined one. It was clear that he meant business. The hero still jumped down and up again at the opposite turnbuckle, mirroring his actions on the other side, before settling down in his corner to observe the appearance of his opponent tonight. "Cmon Kairi, can't I fight him instead?" "No Ryo, you'll just scare him away by flirting with him, like you did that Drake guy we fought." "Oh come on, he's super cute! He's fighting in a speedo! Speedo vs Speedo!" "Those are tights you horny idiot. You can back me up in the corner, but don't get involved. I haven't gotten an actual match since I came back, I want this to be good." With the argument done backstage, Kairi Kamiya smiled as her music started playing, signaling her arrival to the ring. Despite making her return to AFW months ago, she had yet to have a real match yet. Her first attempt became a no contest, and her second, a handicap match teaming with Ryo, ended with Ryo being pervy and scaring away the other fighter, leading to another no contest. But tonight, it was just her in the ring, and she had full intentions of victory! Coming out, clad in her hot pink one-piece outfit, along with heavy boots and gloves, with Ryo following up behind her, in nothing but his usual speedo, the female member of the Kamiya siblings slid under the ropes and got into the ring, offering a little bow towards her opponent. "Starboy, right? I'm Kairi Kamiya. It's nice to meet you!" She said respectfully, trying to make it clear that she was the Kamiya with at least some sense of class...which Ryo made a point of proving, as the speedo clad teen rolled into the ring and moved up to Starboy, putting an arm on his shoulder, casually, and looking him up and down. "Hey there cutie...Ryo Kamiya. Love the outfit...sure you wouldn't rather wrestle me instead?" Kairi sighed, face palming herself and shaking her head in dismay. Idiot. Starboy paid careful attention to his opponent's entrance. He knew he was facing someone with legacy in wrestling, and any observations that could have helped him evaluate his opponent more accurately or predict the moves they were going to be using were warmly welcomed. And boy, did she look like a wrestler. A real wrestler. Not like one of those girls who dressed up into the ring as if they were going to a beach, or one of those who loved to cosplay, like himself. No, this girl clearly meant business. Unlike her bodyguard, who she was apparently having with her. Star would have sent him to the beach immediately. Watching as Kairi slid under the ropes and came straight at him, Star got the distinct feeling that this could turn out to be an interesting match. The young Kamiya was no hulking brute, but her body looked great in her outfit, and she would surely put his skills to a test. Mimicking her bow, the hero was ready to give her the respect an honorable fighter deserved. "Yes, I am the hero. You look great, but - "
Star's words were interrupted by the fact that the bodyguard had just entered the ring too. Funnily enough, he wanted to introduce himself too. So, he was a Kamiya too. Now that Star could actually see him better, of course he was. Unfortunately, Ryo's way of introducing himself was incredibly annoying. Not only was he somewhere where he shouldn't have been, but he managed to come off as rather condescending at the same time. "Well hey there, Mr Kamiya. I wish I could say the same of your outfit... And I'm pretty sure miss Kairi here is perfectly capable of holding her own herself!" the hero stated in an unimpressed tone. Resisting the urge of pushing the speedo-clad boy away from him, Star ended up giving his actual opponent a little too much credit already before the match had even started than he would have wanted to, in his attempt to get Ryo to leave him and Kairi alone in the ring. Well that didn't go the way Ryo hoped. Starboy clearly disapproved of him. Ryo pouted a little, clearly feeling brushed off. "Awww, you gotta diss the speedo too? That's gotta be the fastest rejection I've ever gotten. Whatever, have a good time you two." He said, shrugging and patting Starboy's shoulder and walking away, rolling his eyes at Kairi sticking her tongue out at him as he got out of the ring and leaned against the ring apron to watch. "Aww, he liked you too. Still, he kinda has a point, I mean, its not like your outfit isn't as small and skimpy, minus the boots. But your right too. I can more than handle my own, as your gonna find out, Hero-Boy." Kairi said, stretching in the corner and getting her arms up, waiting for the bell to ring to start the match! Acting slightly uncorteous towards Ryo had some good reasons behind it. The most obvious was the fact that instead if getting Kairi into the ring as his opponent, Star now had two Kamiyas facing him. And while it did of course not automatically mean that the two would have been teaming up, the hero recognized a clear risk of getting dragged into a handicap match. Getting the other Kamiya out of the ring could obviously alleviate that danger. Luckily, Ryo didn't feel the need to extend his offer on switching opponents any further, instead marching promptly out of the ring. Not without a pat on Starboy's shoulder however, which was slightly annoying, but quickly remedied by the clear joy the turn of events had sparked in Kairi. Maybe Star was in good terms with her now? Maybe, maybe not. At least she did comment on his outfit. That caused Star to slightly blush. 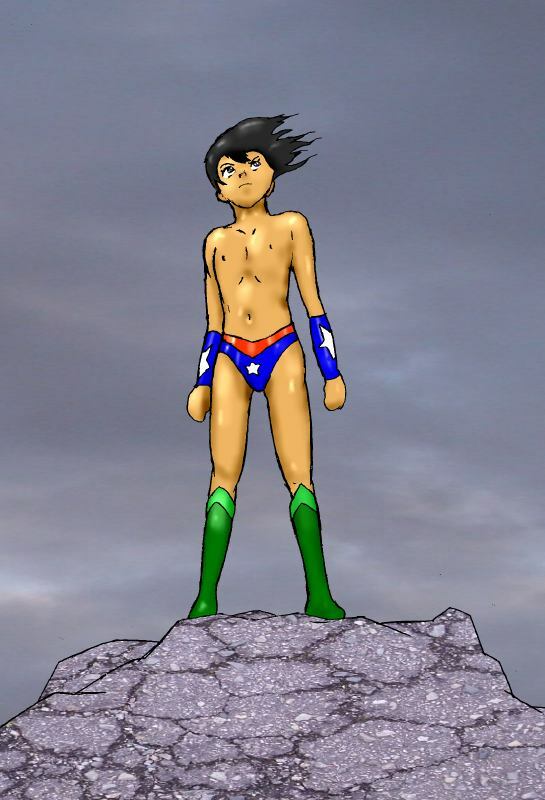 He had mostly considered his outfit to appear heroic so far, not just small and skimpy. But then again, it was true.....and only natural for a wrestling league such as AFW. "Fair enough, let's get it on!" the hero stated, trying to sound confident despite his blush as he took a few steps back before the bell rang. As soon as the bell had rung, Star mimicked Kairi's stance by getting his arms up as he approached her. He still wanted to try keeping up the banter for a bit. "So, what bad have you done, so that they've had to send here a hero to teach you a lesson tonight?" What bad had she done? Geez, this kid really seemed to like his gimmick, didn't he? Very well, no reason she couldn't play along. "What bad? Hmm..well..." She stalled for a moment, trying to think of something, before getting a flash of inspiration, and pointing at Ryo. "I'm the one that convinced him to wrestle in a speedo! Mwahahaha!" That was good, the evil laugh really sold it, Kairi putting the back of her hand at her mouth in a pose she had seen villains in some anime's she watched use. Sure, Ryo didn't seem to appreciate the joke on him, frowning and crossing his arms, but screw him, it was funny. The bell would ring soon after, and she stepped out, towards the center of the ring, looking to lock up with her cute opponent! Did Star actually think Kairi would be an evil villainess on the ring? Not really. There was just nothing that would have implied at all to that direction. But he did treasure his gimmick as a superhero. He had gotten used to it in the ring, and he had to admit that it had some consequences. One of them was that when he was fighting against a villain, he did have that ounce of extra adrenaline running through his veins. Against a pro with family legacy like Kairi, that extra ounce couldn't hurt. To be honest, her answer was not the most aggravating one. But it was fun. "Nice one... That is definitely something I have to make you pay for." the hero stated bluntly, but still with a hint of impression in his tone, before starting to slowly approach his opponent. He did in fact appreciate both her willingness to crack jokes on Ryo, and also her attempt at bringing some evil into the ring. But right now Kairi wanted to lock up with him, and that was suiting Star more than fine. He was wanting to come up with some strategy, and that was still very difficult due to some questions still unanswered. But Star figured that there was just as fair chance that she did not. The lock-up would provide some decent answers. As the two locked up, the hero decided to take it easy at first. He wanted to test Kairi, trying to make her gradually increase her efforts to the max, while trying to counter them himself. And some words of discouragement could probably help him with proceeding according to that plan. "You can't win a hero!" "Boo! I've got the best outfit here!" Ryo yelled from ringside, clearly having taken offense. Kairi ignored him, focusing instead on pushing against the cute Starboy's arms, each of them gradually increasing the strength they put into the lock up, testing each other out. "Can't win a hero? Still working on your English?" she teased, playing into this little role of a villain that he seemed to want her to play. Villains mocked heroes, right? "If you need some help with your English tongue...maybe my tongue can help yours out..." She said in a softer, more sultry tone, making a little sensual pun that made even the oversexed Ryo groan in response. She ignored him though, and pushed harder, trying to see if she could push the little superhero back towards the corner! Ryo's protests only made Starboy subtly smile inside as it appeared that he had won Kairi over to his own side against his cousin. That could have been a good omen for continuation of the match...but just as fast, the hero's content turned into slight irritation as clearly the cute Kamiya wasn't above mocking him too! While he couldn't exactly figure out what she was mocking him for, he knew those words had been on his expense. As Star was momentarily confused over her words, Kairi managed to push him a few steps backwards. But then the hero found some more strength as her teasing demanded remedy, halting the progress for a moment. But Kairi's sudden flirtation managed to surprise and confuse the hero again, as faint blush developed on his cheeks, resulting in further advancement for the girl in their test of strength. Kairi giggled, her flirting clearly having some kind of effect on Starboy, letting her push him halfway to the corner, before he got his head back into the game, pushing against her, forcing her back a few steps. Finally, Kairi broke their stalemate, falling back, her hold on his arms pulling him down with her, while lifting her foot and pressing it against Starboys chest, trying tl throw him over her head with a monkey flip!